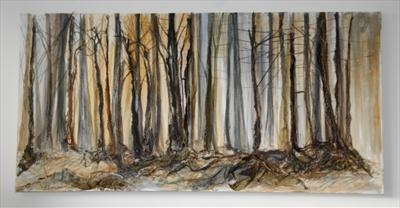 A work in paint on canvas with applied stitch evoking the atmosphere of low winter light glimpsed through trees. The stitch gives another dimension to the surface. A response to a series of drawings of winter trees, observations of the effects of light on the subject. The piece is worked as a painting built in layers with the layer of stitch worked on dissolvable fabric, then applied to the canvas with hand stitch. Further painting with colour and mediums is worked to integrate the stitch with the painting.